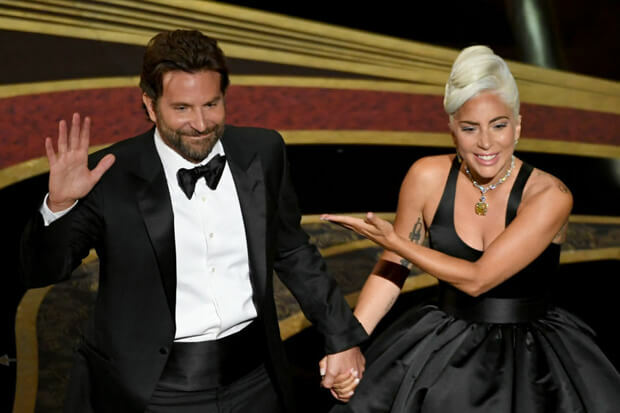 Lady Gaga and Bradley Cooper’s “Shallow” emerged as a big winner at the 2019 Oscars. Last night (February 24), the A Star Is Born duo won the title of Best Original Song for the soaring anthem. They also showcased their excellent chemistry with a show-stealing performance during the ceremony. Emerging from the crowd, the exceptionally dressed collaborators delivered no shortage of eye contact and excellent vocals. Mother Monster’s wins continued through the night and into this morning with discussions of the performance dominating social media. Toss in an adorable photo with Madonna at the Queen Of Pop’s after-party, and it is safe to say that she had a wonderful evening. It was a big night for music in general with several other equally strong performances throughout the show. Adam Lambert joined iconic rockers Queen to kick things off with a rip-roaring medley of hits including “We Will Rock You” and “We Are The Champions.” Meanwhile, Jennifer Hudson served serious vocal gymnastics with a strong rendition of her RBG contribution “I’ll Fight.” Bette Middler left us in awe during a stunning performance of “The Place Where Lost Things Go” from Mary Poppins Returns. Gillian Welch and David Rawlings also played their Best Original Song-nominated “When A Cowboy Trades His Spurs For Wings.” Check out footage from the sets below! Did you watch the Oscars last night? Let us know below, or by hitting us up on Facebook and Twitter!